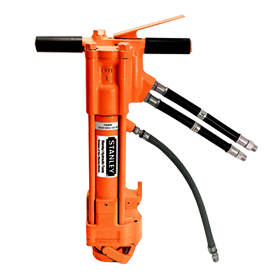 The SK47 and SK58 line of hydraulic sinker drills are designed for blast hole drilling, leak detection for gas utilities, and dowel hole drilling. Sinker drills use either air or water flushing (model dependent) to clear holes of debris. All models feature a featehring trigger for easy starts and is adjustable from 0 to 300 rpm. The SK47 is capable of drilling of holes 2 inches in diameter and 10 feet deep. The SK58 is capable of drilling up to 3 inch hole diameters up to 20 feet deep.